View More In Face Protection. mining, metallurgy, fire-fighting, industrial production, paint application, and smoke/ toxic vapor filtration. PROFESSIONAL HEAVY DUTY FILTRATION SYSTEM - Dual filter cartridges & impact resistant lens. 3M cartridge compatible. Ready to protect you from all environments. 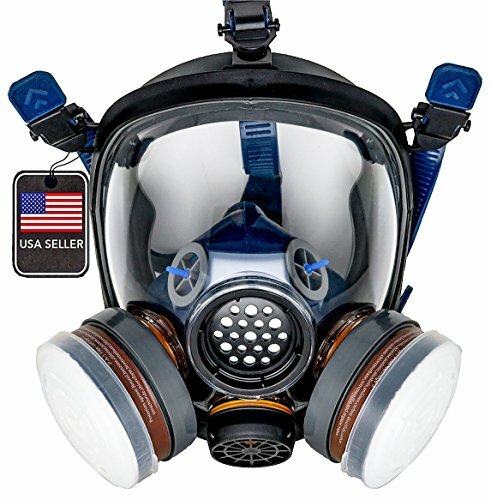 USA DISTRIBUTED - HIGH QUALITY - ENGLISH INSTRUCTIONS - Premium full-face mask. Made of non toxic materials. MULTI PURPOSE PROTECTION - The perfect mask for working with chemicals and other toxic substances. Including pesticide protection, chemical laboratory, fire inspection equipment, health/epidemic prevention, and environmental technology. If you have any questions about this product by Parcil Distribution, contact us by completing and submitting the form below. If you are looking for a specif part number, please include it with your message.